Russian Foreign Minister Sergey Lavrov has responded to a Monday report in The Guardian that the United States has started manufacturing a low-yield nuclear warhead, warning that it has heightened the risk of a nuclear conflict. Lavrov said that Moscow voiced its concern last year over the W76-2 warhead, which "lowers the threshold of nuclear weapons use and, of course, boosts the risk of a nuclear conflict." "Apparently, these plans were put into practice," said Lavrov, adding: "Certainly, it won’t contribute to global security." 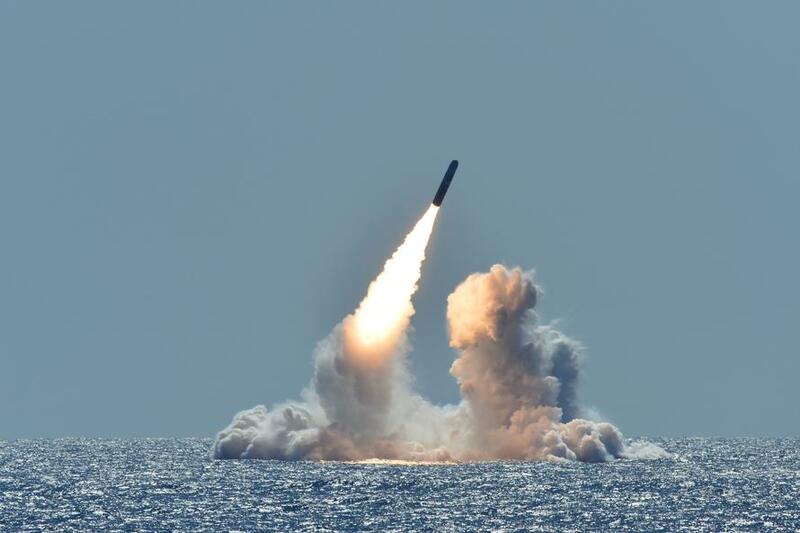 As we noted on Monday, the new weapon - the W76-2, is a modification of an existing Trident nuclear warhead. According to the NNSA, the first batch have come off the production line, and an unspecified number of them referred to as "initial operational capability" will be ready for delivery before the end of September. According to Stephen Young, a senior Washington representative of the Union of Concerned Scientists, the yield on the W76 was likely reduced to created the W76-2 by removing one stage from the original two-stage device. "As best we can tell, the only requirement is to replace the existing secondary, or second stage, with a dummy version, which is what they do every time they test fly a missile," said Young, who noted that the amount of the hydrogen isotope tritium may also be adjusted. The result is that the yield has been reduced by 95% - from 100 kilotons of TNT to around five kilotons; around 1/3 of the force of the bomb dropped on Hiroshima. According to the Trump administration, a low-yield nuke will make nuclear war less likely, as the US will have a more flexible deterrent. The W76-2 would be able to counter the perception by enemies (particularly Russia, according to The Guardian) that the US would balk at using its massive nuclear arsenal in response to a similarly small nuclear attack since existing US nukes are in the hundreds of kilotons range, and "too big to use" without massive civilian casualties. Low-yield nukes "help ensure that potential adversaries perceive no possible advantage in limited nuclear escalation, making nuclear employment less likely" reads the 2018 nuclear posture review. Critics point out that this is crazy talk which assumes that there are no miscalculations. "There are many other scenarios, especially with a president who takes pride in his unpredictability and has literally asked: ‘Why can’t we use our nuclear weapons?'" said Young. Meanwhile Melissa Hanham of the One Earth Future foundation notes that foreign enemies would have no way of knowing if the United States had fired a full-force Trident or the a low-yield version. Hey all you nuclear powers out there.👋 We’re just going to trust that you recognize this is “just a little nuclear weapon” and won’t retaliate with all you’ve got. 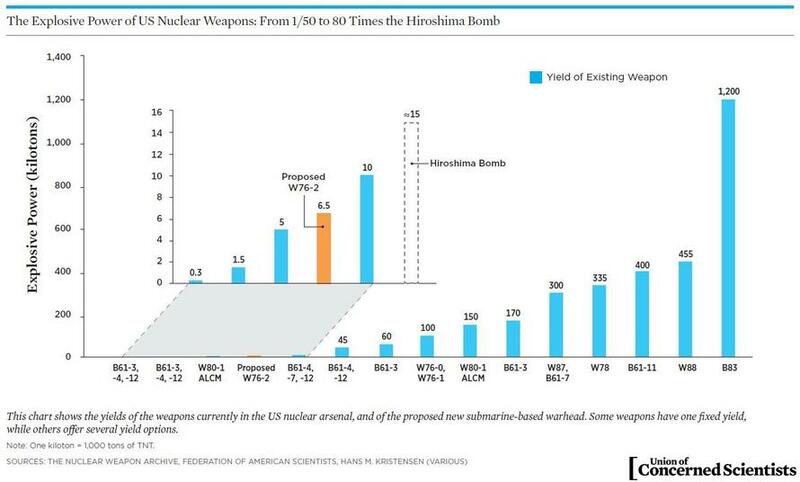 Former Defense Secretary William Perry told reporters last week that he was less worried about the amount of nuclear warheads remaining in the world than by the dialogue shifting back to said weapons being "usable." "The belief that there might be tactical advantage using nuclear weapons – which I haven’t heard that being openly discussed in the United States or in Russia for a good many years – is happening now in those countries which I think is extremely distressing," said Perry, adding "That’s a very dangerous belief."